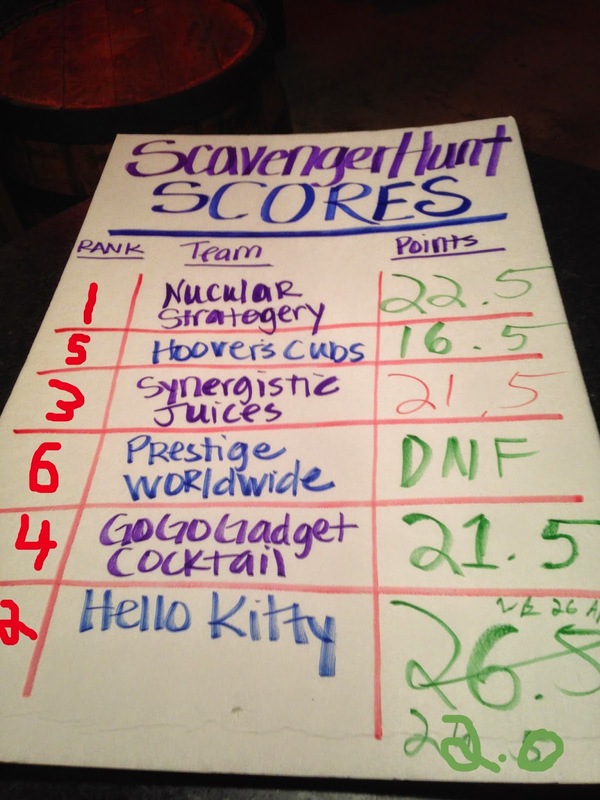 It was an overcast day when six teams descended upon the streets of NorthEast Minneapolis to partake in what many feel is the greatest event of every Kickball season, the Scavenger Hunt. At roughly 1.00 pm a fog horn start sent the teams to the streets to take in their surroundings. It was a shame that the needle point was stolen from the Vegas Lounge (pictured below), it was pretty swell. Dom shows were experienced in the basement of the Moose, Railroad tracks were ventured upon to get some siiick graffiti pictures and artisitic (pornogrpahic, maybe?) reenactments of photos were done at Lush as well! Some people got fingered at Spring Street Tavern, while others were winning pull tabs (woot, woot!). Regardless good times were had, libations consumed and memories made. We all made it back to Legends and ate some food. Hello Kitty was accused of Tom-Foolery, more drinks were had!! Thanks to everyone that came out and made the scavenger hunt memorable and this editor is looking forward to many more memories this season! Slash be sure you send summaries/pictures to EditorGMOT@gmail.com. This is the email address for the league. All the leagues, we don't discriminate! If you send it to us, we will make sure it gets on the blog. Come back soon now, ya hear? !